Forum Home > eBay, LeBonCoin, Mercado Libre, Yahoo Japan, etc. 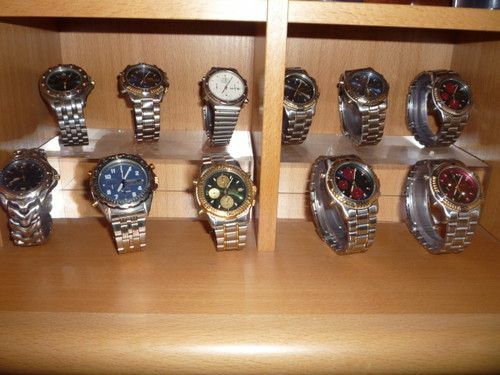 > Finding Hidden 7Axx 'Gems' amongst other dross watches. Not having very deep pockets, I tend to search every nook and cranny of Ebay Germany,.com etc. I found this 7A28-7040 lurking in a dark corner of ebay.germany (sorry paul, I do not know how to copy Ebay pages,photos). I have a near mint 7A28-7040 case if this one is battered, but no original strap. I shall keep the ana/digi watch (I have a similar Accurist) and eventually move on the others, any interest? So it does pay to be persistent and search mixed lots. 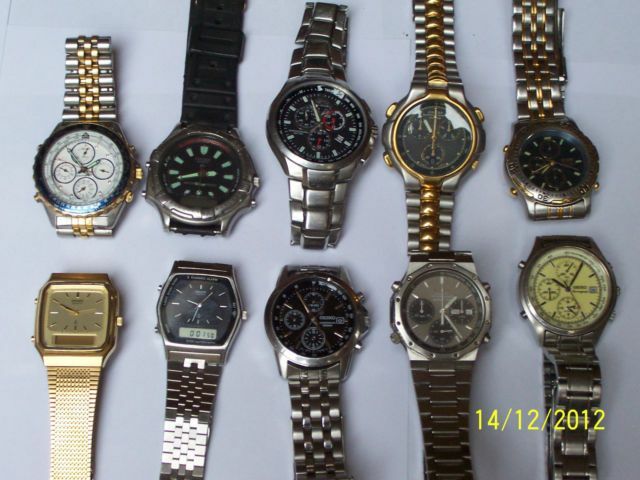 Didn't you buy another similar 'job lot collection' like this, before, which included a Dugena Cal 35xx chrono, Chris ? 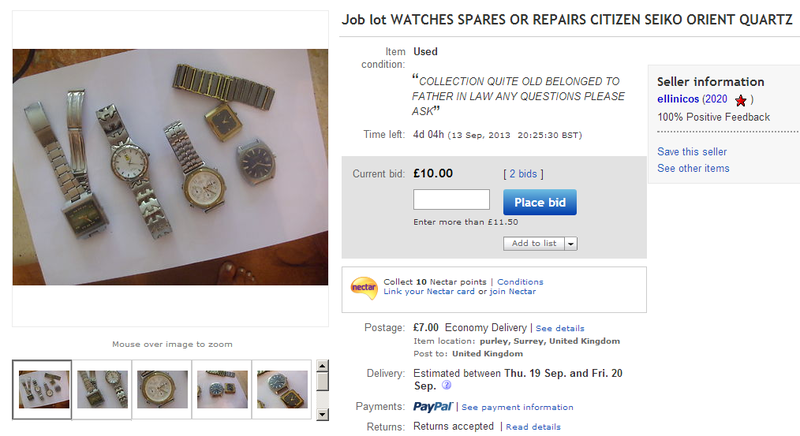 I'd suggest with the others you don't want, you photograph them, and put them back on eBay, properly desribed. You got my hopes up there Paul ! 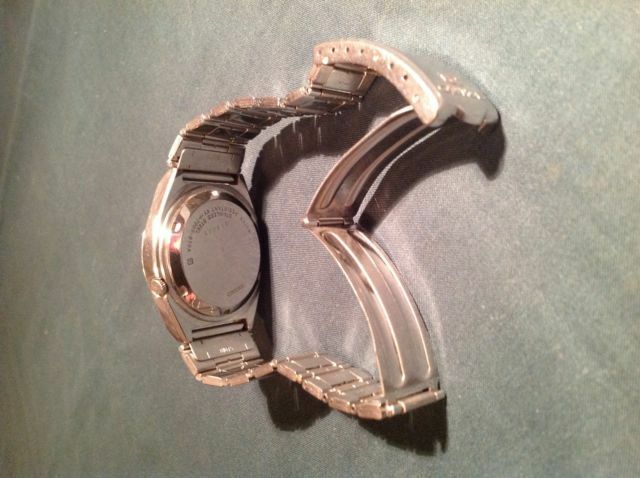 The Dugena was a G/p Ladies watch, and the Titanium Seiko 7A28 had a cracked crystal and thus damaged lume. More work for me in the long run, but I will eventually give it a make-over. Well it was a bloody awful listing photograph ! Remind me of the eBay listing number, Chris, and I'll post the photo up, to show the others what we were guessing at. One of the downsides of buying 'job lot' watch collections to get the odd 7Axx, is getting rid of the unwanted junk afterwards. 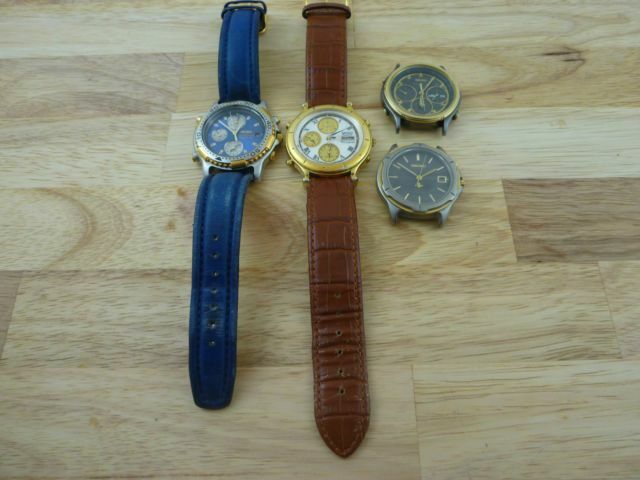 Un-wanted junk, the Timex chrono is a horology classic LOL ! Won that auction quite cheaply, but seller was very slow sending me an invoice, so I just sent auction winning amount plus substantial post amount, seller kept the difference which was a bit naughty! Like I said, Chris - it was a pretty awful listing photo, even when rotated through 90° ! 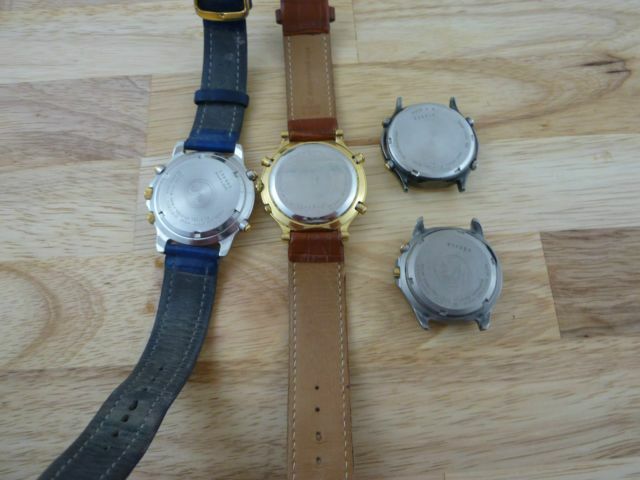 Swatch, Fossil, Christ, Seiko u.v.m. 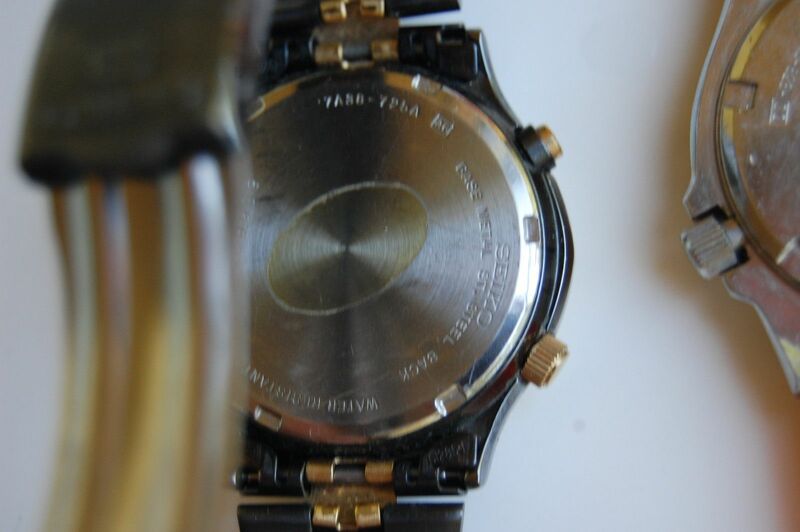 Hard enough to correctly identify the titanium 7A28-7080 - let alone see whether it had a cracked crystal ! As for my wild guess at the one in the bottom LH corner being a Dugena Cal. 35xx (Dugena in the title) - well I got that all wrong. and, in hindsight, if you look at the lower side of the bracelet you can just make out the typical Swatch bracelet link connection. 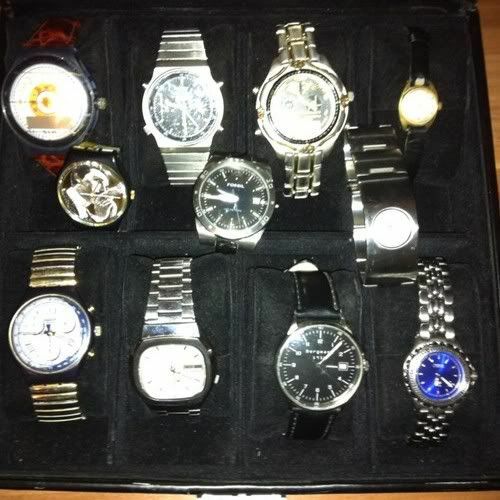 The hideous watch (3rd from left,top row) is a nasty Citizen copy,why anyone made the effort of producing such a monstrocity defies logic! 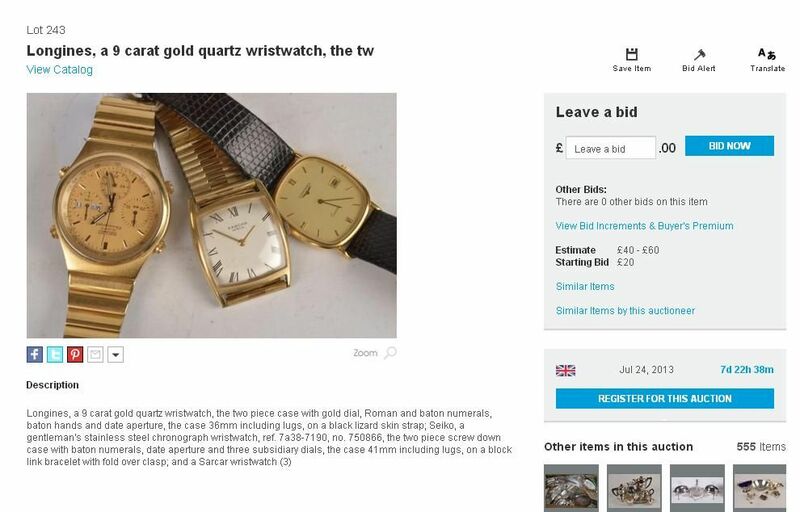 All in, not a bad price for just the 7A28, even though it will need some work, should be able to claw a few quid back for the other watches at some point, hopefully. I tend to avoid buying 7A38's in 'Job Lot's on the basis I'm not very good at getting rid of the other junk that comes with them. I gave the white-faced SQ to a guy at work - as spare parts for his, and the non-functional Kinetic is still languishing in my bits box. I only wanted it for the 'Panda' Orient J39725-70 (Top Left) - which also turned out to need a lot of work, including a new PCB. To save on postage, I told the French eBay seller he could keep the rest of them (gratis), and re-list them if he wanted to !! TOP! 3 VERSCHIEDENE HERRENUHREN, U.A. 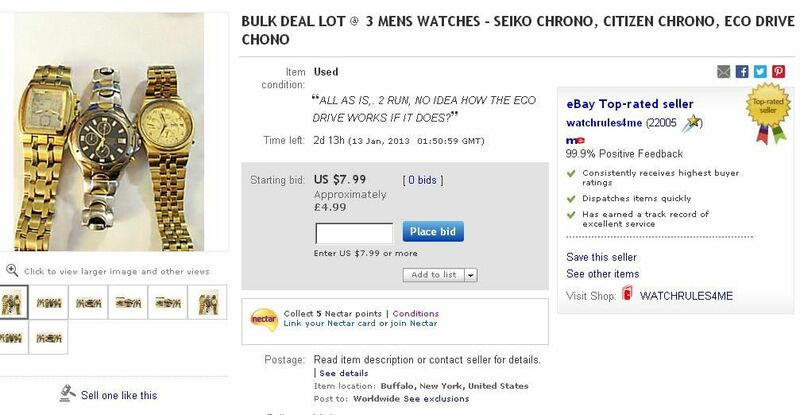 SEIKO, ERSATZTEILSPENDER?, SIEHE BILD! .... which included a 7A38-7020, and just sold 10 minutes ago, for a mere 29.49 Euros (approx. £23.77) after 6 bids. Sold separately, it would probably fetch more than any other watch in this collection (priced collectively at 1190 Euros incidentally). However, presumably because it's only a 'Sports 100', seems it didn't warrant its own individual photo. Some people have no idea. *Then again, zooming in on it, from the bezel, it might actually be the 7A38-7130 cream dial steel version - which is Sports 150 rated. 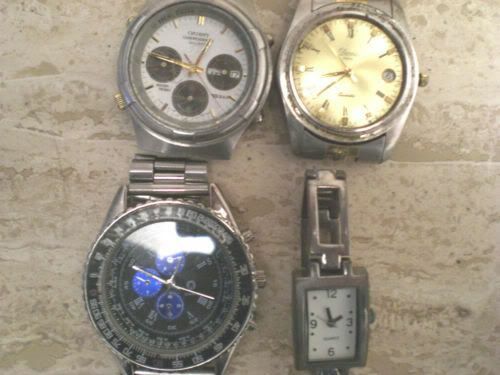 This diverse 'spares or repairs' job lot, comprising mostly quartz analogue chrono's, listed on eBay 10 days ago, looked interesting. 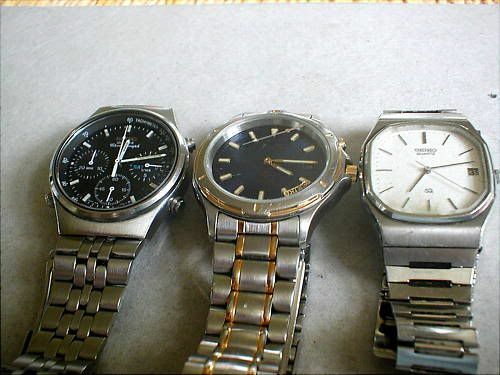 Apart from the possibly half-decent-looking stainless 7A38-7020, there was a 7T32, a 7T34 and a Citizen Cal.3560. 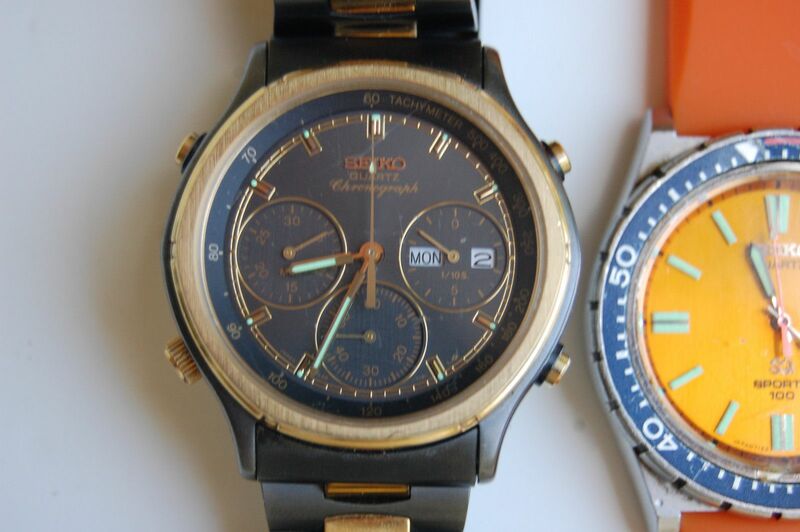 Lot van 10 herenchronografen Seiko + Citizen voor herstelling of onderdelen. 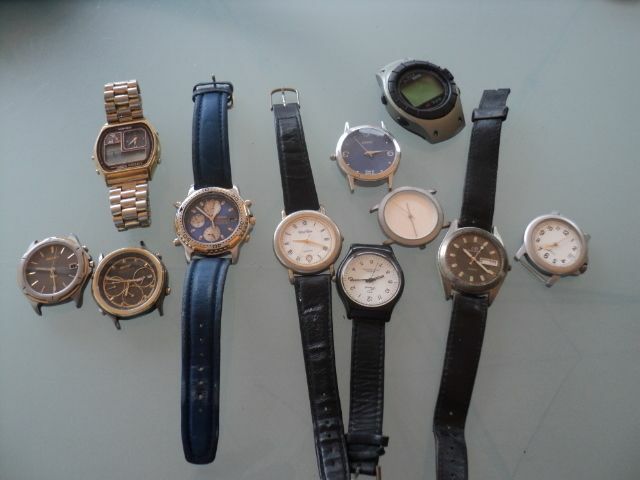 Lot of 10 mens chrono's for repair or spare parts. I was tempted, but when the time came, decided to pass. It went for 63.50 Euros (approx. £54). Possibly a bargain for someone. 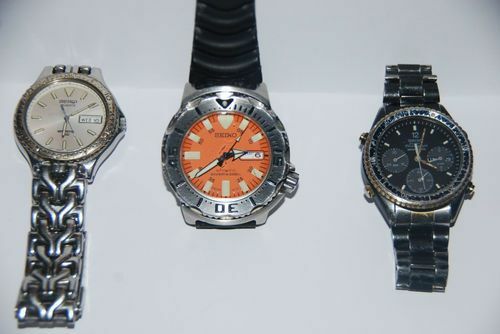 Some auctioneers have no idea how to group (or photograph) lots. 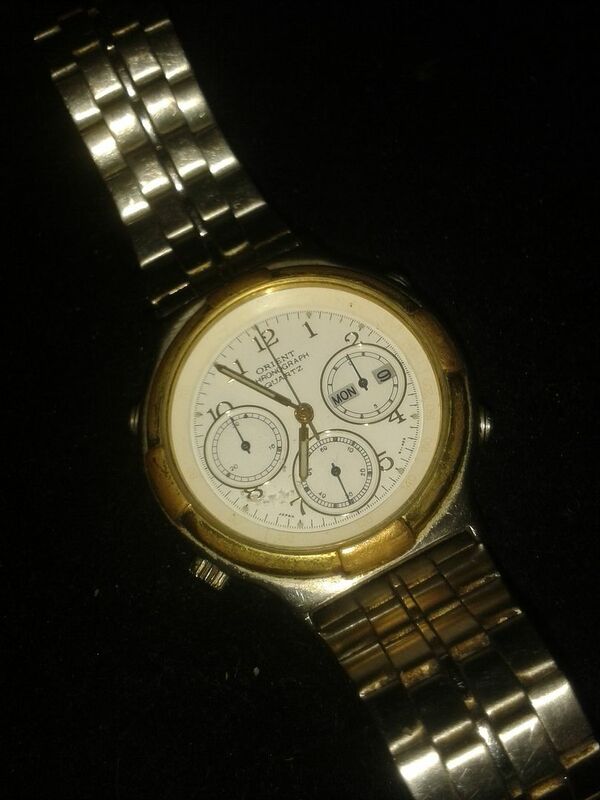 Anybody fancy a Longines 9ct quartz dress watch ? I wouldn't call this a 'hidden gem' exactly, but the 7A28-702A in this 'Spares or Repairs' job lot on eBay Germany, which ended earlier today, might turn out to be a bargain fixer-upper. 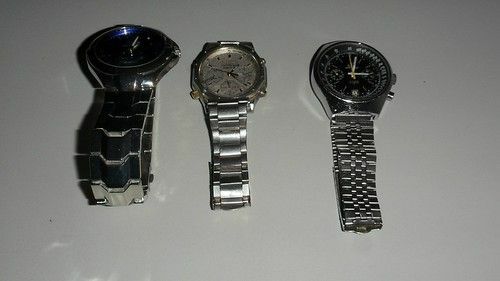 Versteigert wird aus einer Uhrenauflösung vier Seiko Herren Armbanduhr, im gebrauchten Zustand (siehe Bilder). Die Uhren laufen nicht, werden als Bastleruhren versteigert! Bei einer Uhr ist das Glas beschädigt. 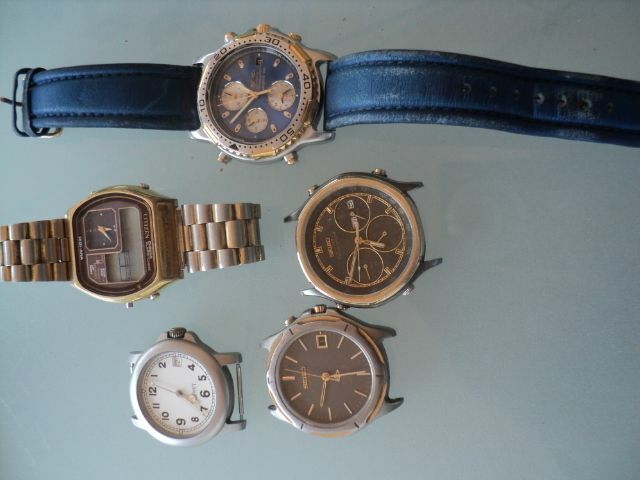 As you can see by comparing the photos, a couple of the watches, besides the 7A38-725A were in the previous job lot. The Seiko 5 is quite nice and wearable and the strap does not nearly look anything as badly scratched in reality. Was a bugger removing the strap as was a very tight fit in the Seiko 5's recessed lugs. All in I am chuffed as these bracelets are hard to find. Chris. I briefly thought about moving your post to the 'Wrong Bracelet' thread, but of course, it's the wrong way round ! 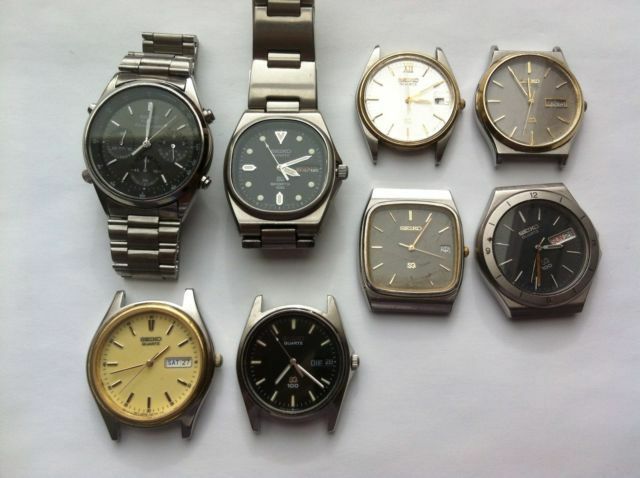 Perhaps we should change the title of your original topic to: Finding Hidden 7Axx 'Gems' ON other dross watches. But seriously - well spotted !! So which bracelet is it ? A B1241S or the B1075S you were looking for at the start of this thread ? 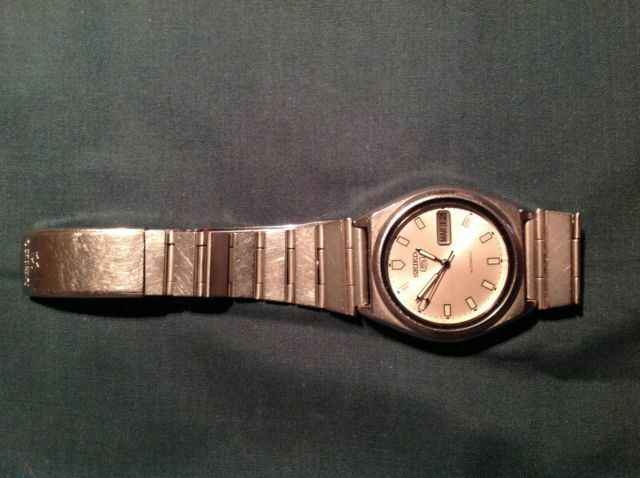 Hard to tell from the seller's photos, but have the end tubes been filed down slightly to fit the Seiko 5's 19mm? lug width ? The Bracelet is a B1075, No "S". I had not offered the strap up to the case.......until I read your comment. Yes the end tubes have been filed down and there is a bit of play.....bloody butcher! Im sure I can remedy the play as this will annoy me when wearing the bracelet. Maybe force some thicker spring bars down the end tubes so there is no movement.